We woke to another beautiful day, but noticing the increasing haze from villages now forced to burn wood for cooking. Still the border has not been opened, both India and Neoal Givernments are arguing about the constitution. 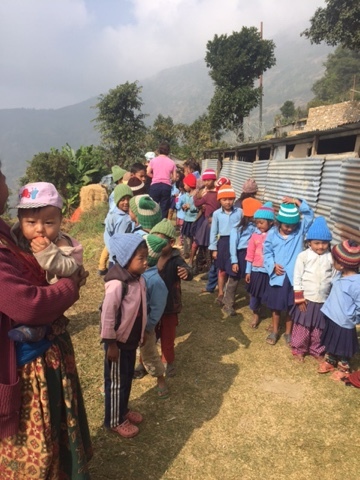 If they continue within this stand off then in 4 weeks Nepal will be out of food and gasoline, it is a terrible situation which needs to be resolved before winter. 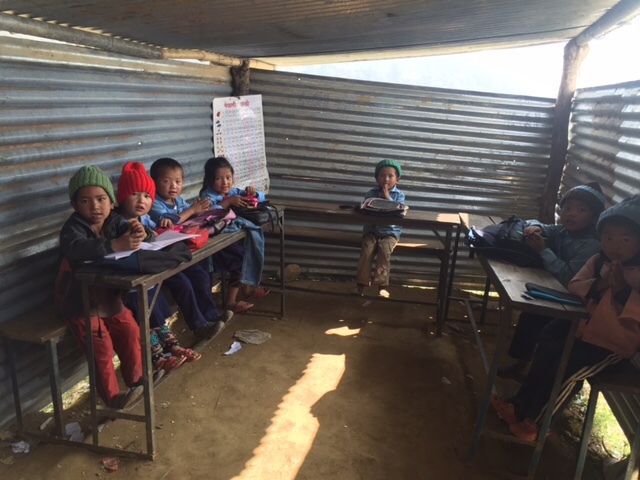 Our morning began with a visit to the little temporary school of 60 students, this number has decreased by half as many families moved to other areas such as Chitwan and Kathmandu, they will all hopefully return once they receive the $2000 from the government to rebuild their homes. 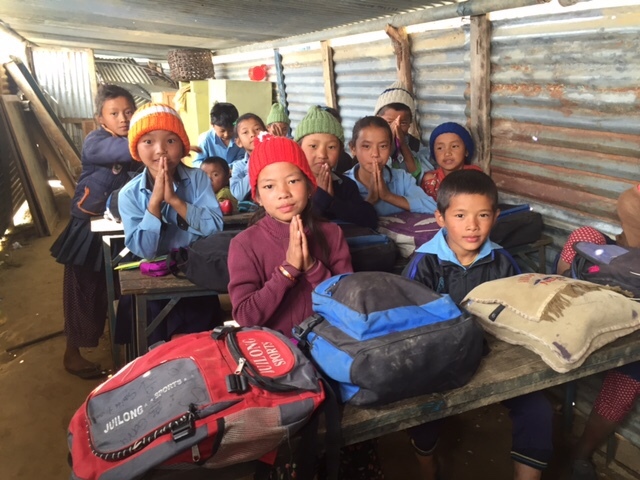 At the school we handed out donations of clothing and school equipment to each child. 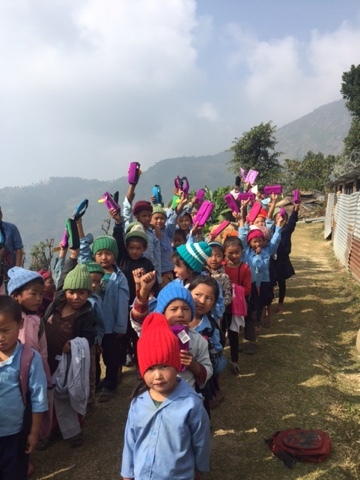 We also handed out blankerpts to the poorer people of the community, and many baby clothes to new born and infants. 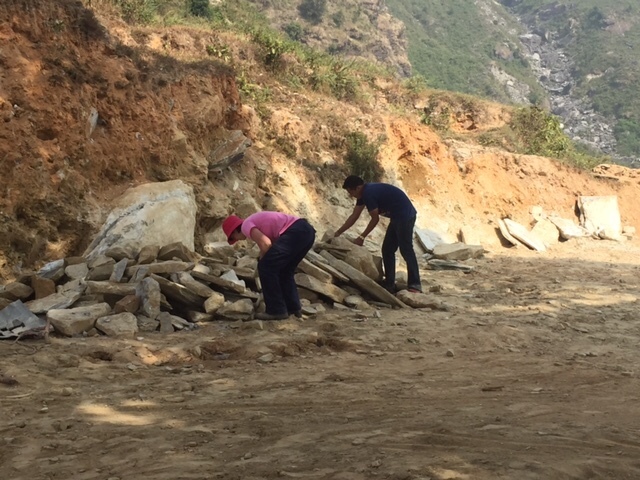 The remainder of the day was spent moving rock at the school site, we were assisted by Dil and a group of teenagers who had not yet returned to school. It was hard work but rewarding to see some action taking place. 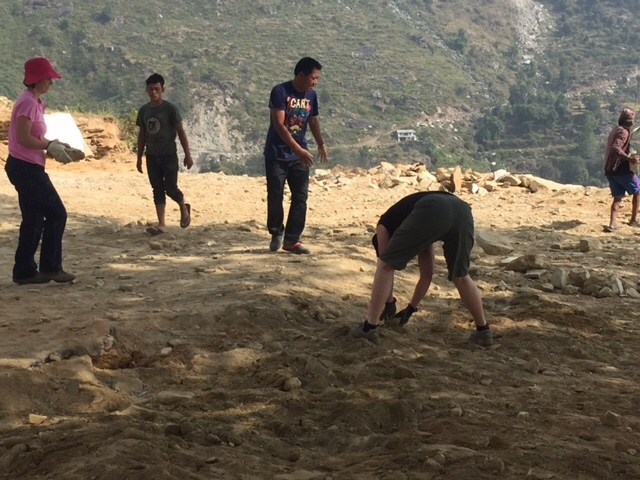 The men of the village were working on repairing the road to Ganga Jumina, which had been blocked by a landslide. They will join us tomorrow on the school site where they will prepare a retaining wall and finish levelling the site. All the stone we moved today will be broken up into gravel, and this will be done by hand. The tools we have are very primitive we do not even have a wheelbarrow to move the rocks! We have a piece of tin sheeting with two holes at one end with rope and handles like a sled, we pile the rocks onto the sled and drag them to the rock pile. Exhausting! Tomorrow is anther day and another step forward.